A friend's blog post on John Coltrane's Dakar inspired me to write this. 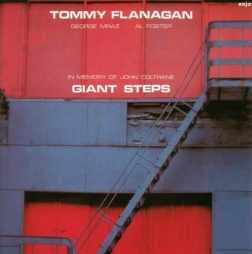 I have two versions of Giant Steps, the original Coltrane classic, originally released in 1959, and the Tommy Flanagan remake, released in 1982. Flanagan played on the original album (on all but one track) and he did the remake in honor and memory of Coltrane. I was surprised by the similarities and differences. 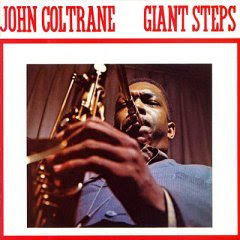 Coltrane opens with Giant Steps and closes with Mr. P.C., while Flanagan opens with Mr. P.C. and ends with Giant Steps. The numbers reflect this: Coltrane's Giant Steps is vibrant, a great opening, while Flanagan's is delicate, good for a coda. On Mr. P.C., Coltrane's version is awesome, but Flanagan's is distinctively different -- it really sets the tone for hs album, especially the opening, where the substitution of piano for sax changes the whole tenor of the song (the other number where this is the case is Syeeda's Song Flute). I have the reissue of the Coltrane version which has some alternate tracks, so I interspersed them as well. In general, they were not as good. The alternate take of Cousin Mary had some excellent passages that I liked better than the original but it was weaker overall. Countdown, which is only on the Coltrane album, is the only one where I liked the alternate take better and it's close there. The original is shorter, tight, and wonderful, but the alternate gives me more to enjoy. Overall, I enjoyed the experiment. They are both great albums. If I had to pick a favorite overall, it would be Coltrane. That's not too surprising. NOTE: Amazon has multiple copies of the Coltrane album, at different prices. I don't know the difference, but I've linked to the cheaper one above. For the Flanagan album, Amazon only has an expensive import available (the non-import says it's not available).